We have been assisted this summer by Emily Christopherson, who has just completed her second year studying BSc Geography at Lancaster University. Emily writes about her work in this blog post. This summer I undertook a 6-week placement with JBA Consulting at their Warrington office, where my work has involved completing projects for the JBA Trust. I have gained valuable experience in researching Natural Flood Management (NFM) schemes in the UK and have updated the JBA Trust’s nature-based processes database and online catalogue. Throughout the researching stage I visited other JBA offices to meet with colleagues who have been involved in schemes and research into NFM. I also wrote a bulletin which was sent out to the Environment Agency and posted on their forum to request information on NFM schemes for help updating the online catalogue. Part of my work also involved improving the online catalogue through reviewing peer-reviewed journal papers on NFM and adding a new layer onto the interactive map, specifically for peer-reviewed schemes. The placement allowed me to support the development of Working with Natural Processes (WwNP) cost-benefit ratio database, where I used the Environment Agency’s WwNP evidence base to research NFM schemes, their benefits and what the value of these benefits were in comparison to their costs. A further task involved me using GIS to create maps of peak flows at UK gauging stations for use in an article in the Royal Statistical Society’s Significance magazine. During my second week I attended an engagement event at Calderstones School’s careers day, where I, along with two colleagues, spoke to students aged 11 to 18 about working in the environmental sector. 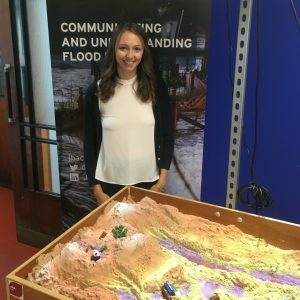 I learned about setting up and calibrating the JBA Trust’s Augmented Reality Sandbox, which we took with us to the school to show students how working with natural processes can help to reduce flooding. Additionally, I supported colleagues by transcribing comments and suggestions from workshops and training days, and researching information to prepare a presentation on international approaches to flood and coastal erosion risk management. During lunchtimes I attended webinars in the office to enhance my knowledge and learning, these webinars focused on alternative measures for QMED and natural capital. I have developed and enhanced many key skills for working in the flood-risk industry. A colleague at JBA taught me how to use the JScreen model to see the effect of culverts on flood risk, how to find catchment descriptors using FEH and how to manipulate large data sets using functions in Excel; in addition I have improved my GIS skills using ARCGIS to map peak flows. I have had a valuable experience with the JBA Trust and enjoyed working with colleagues who have been friendly and welcoming.